A glimpse of the vast talent amongst City's student population was on display this week at Startup Fest, CityStarters annual showcase of student talent. The free half-day event was an opportunity for enterprising students at City and beyond to discover the range of support available to those looking to start their own business. Visitors were able to meet students and alumni who are already developing their own businesses with support from CityStarters, for example, 'Stubble and Strife', an innovative supplier of male grooming products; and 'Cycl', whose new product WingLights (pictured, right) has the potential to revolutionise cycling by introducing handle mounted indicators to the market. 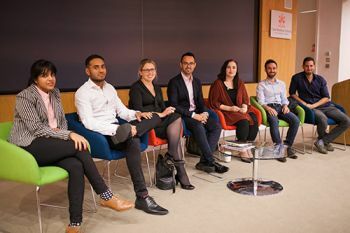 Nadia Finer, Author of The Starters' Manifesto, said she was impressed with the talent on show: "Startup Fest was a hive of entrepreneurial energy and enthusiasm. It was truly inspiring to meet so many fresh young minds buzzing with ideas and the drive to succeed. If the future of this country is in the hands of the students I met at City University's Startup Fest, then the future is very bright indeed!" Other highlights included displays from Tech City News, the leading resource of news, events and information for technology innovators in London, which is edited by City alumnus and visiting lecturer Alex Wood and by University representatives like The Hangout, City Unrulyversity and Cass Entrepreneurship Network. Hakkim Ali, MA Creative Writing Student said: "Startup Fest was an exciting, insightful and well-executed introduction to the entrepreneurial resources available at City. It was great to network with fellow entrepreneurs and exchange ideas. Totally looking forward to the upcoming Business Seminar sessions!" There were also a number of taster seminars giving visitors an insight into some of the expertise on offer at City. Stefania Zerbinati, Senior Lecturer at Cass Business School gave a talk on Entrepreneurship and Reader in Marketing, Caroline Wiertz, led a session on Viral Videos. There were also talks from some of City's successful entrepreneurs including Frank Milani, whose start-up Popcord, has exceeded their Kickstarter target of £20,000 and has now raised nearly £50,000 in funding. Dhruvin Patel, Founder of Ocushield which is supported by the NHS, and protects users eyes from the blue light emitted by electronic devices, also shared his insights. Enterprise Education Manager, Ben Mumby-Croft who curated the event said: "It was really great to see the entrepreneurial talent from City on display at Startup Fest 2014 as well as the level of engagement from students and staff alike. If this one event is anything to go by the next academic year promises to be the most enterprising yet!" The event, which was attended by over 250 people, was wrapped up with a call for the next cohort of entrepreneurs with the launch of CitySpark 2014-15.